This engineer has just picked up his mid-morning snack from the club car. A quick word with the conductor and it's time for moving on. Earlier this week, I completed the formidable task of transcription of original train information, which now covers the entire history of VIA Rail, from 1976 to 2011. I was amazed by the amount of information transcribed - VIA's motive power, rolling stock, equipment cycles and rotation of equipment, and of course unique and colourful consists. And many, many additions to paint scheme transition data. Now I'm moving on. 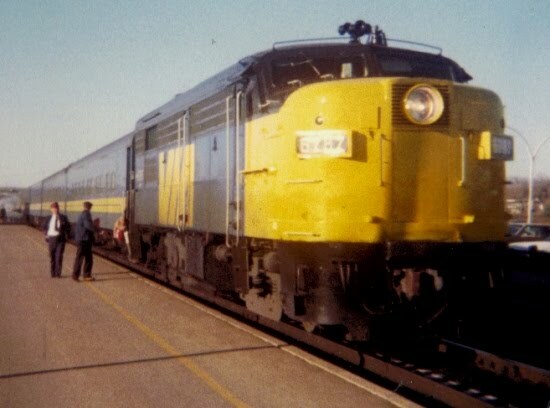 Western consists throughout VIA's early years: River-class and I-series sleepers used as crew accommodation, a nice mix of E-series and Chateau/Manor cars, CP Geeps and RS's on the Canadian, and quite a few surprises. Then I'll be working hard to complete the many other parts of this book. Expect a notable contribution from a well-known VIAphile. Highball!